OWNER FINANCING AVAILABLE!! If you are looking to relocate to Montana, or maybe just want a site for a vacation home, this property may be ideal for you. 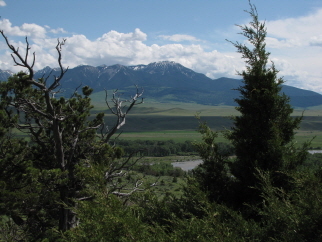 13.55 acres on a ridge above the Yellowstone River Valley, this property offers huge views and some great building sites. Power and phone on site, this property is about 10 miles east of Livingston (pop 7000) and about 40 miles east of Bozeman (pop 40,000). It is located about 60 miles north of Yellowstone National Park. Great area for fishing (less than a mile from the Yellowstone River, about 3.5 miles from the Shields River). Call for an information packet on this property. The owner will finance with 15% down. A wonderful property above the Yellowstone River with huge views of the Absaroka Mountains to the south. Nice large meadow for a building site, power and phone on site and preapproved for a septic. Trees along the ridges include ponderosa pines and junipers. Wonderful valley views with big mountain views for a backdrop. This property is part of the River Run subdivision which gives you part ownership in an 80 acre island on the Yellowstone River with river access for property owners. Less than a mile off the river, just a half mile up the hill from the county road and less than 5 miles from the state highway.